Former President Jimmy Carter participate in a tribute to former Vice President Walter Mondale, left, in Washington, Oct. 20, 2015. Former President Jimmy Carter cracked jokes at his own expense and waxed philosophical about the world's humanitarian challenges on Tuesday as he honored his former vice president, Walter Mondale. 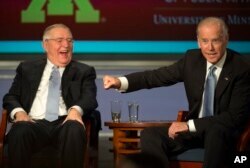 The 90-year-old former president appeared spry and energetic as he lauded Mondale in a packed ballroom in Washington. Carter made no mention of his ongoing battle with cancer, opting instead for nostalgic reflections on his four years with Mondale in the White House. "As a Georgia peanut farmer, I needed a lot of help," Carter said of his decision to empower Mondale as a key adviser, eliciting laughter from the crowd of about 400. Carter revealed in August that cancer had spread to his brain, but declared he was "perfectly at ease" with whatever might follow. Although doctors had removed melanoma from his liver, Carter said they found four small tumors in his brain, prompting a treatment regimen of four injections of a recently approved drug. "You possess so much grace," said Vice President Joe Biden. "The way you have dealt with every difficult moment in your life -- including now -- is a model to which I think few people can compare." The glitzy gala at a hotel near the White House closed out a nearly daylong forum honoring Mondale and hosted by the University of Minnesota's Humphrey School of Public Affairs, where Mondale teaches. The event included panel discussions about how Mondale changed the vice presidency, social justice, civil rights, national security and Carter-Mondale breakthroughs in foreign and domestic policy, local media reported. As Carter sat in a semicircle with Mondale and his former chief of staff, Richard Moe, the event took on the feel of a campfire, a trio of old friends passing time by reminiscing about days past. Turning serious, Carter said the greatest human rights violations in modern times are targeting women and girls, including sexual slavery he said occurs in the U.S. He also threw his unequivocal support behind the nuclear deal with Iran, and said he had conveyed as much to Secretary of State John Kerry during a meeting earlier Tuesday. FILE - Then-Vice President Mondale, right, briefs President Jimmu Carter on his trip to Europe in the Oval Office In Washington, May 24, 1977. 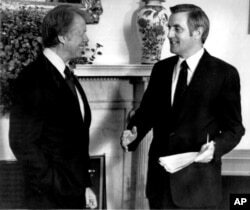 But Carter reserved his most effusive remarks for Mondale, who under Carter's leadership became the first vice president to have an office in the West Wing, steps away from the Oval Office. "He was a perfect partner, and I don't believe we ever had a serious argument during the four years -- which was better than my relationship with my wife," Carter quipped. Although Carter has acknowledged that his condition would force him to scale back his humanitarian work, he's continued making public appearances, teaching Sunday school in his hometown and joining his wife, Rosalynn, at an event for The Carter Center, the humanitarian organization he founded in Atlanta. He had planned to travel to Nepal this November for a Habitat for Humanity project until the group canceled the trip, citing supply shortages and civil unrest.